The SDR-mRCU13-FC operates at a 24VDC safe voltage and 13 independent input/output channels form a one-to-one loop. The control of each channel loop can be configured via software with separate transient surge protection circuits per channel. 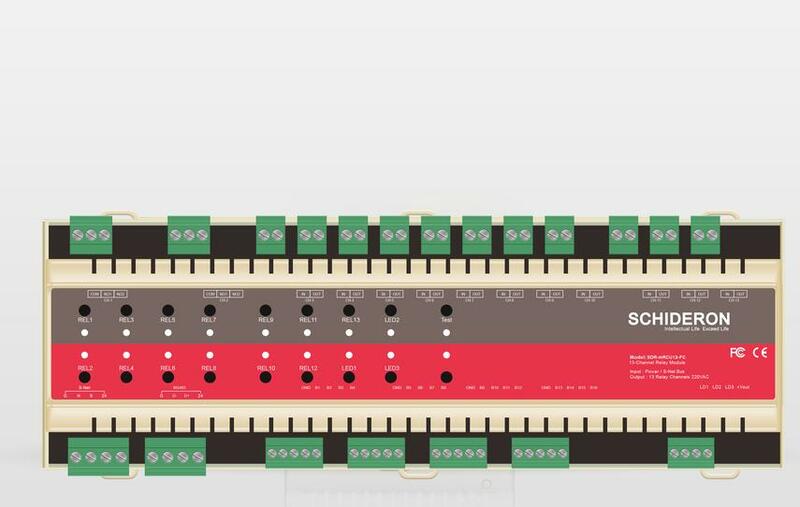 The 11-channel standard resistive load current is 10A, and supports the control of electric curtain motors. The two-channel resistive load current is 30A and supports controlled outlets and air conditioning power control. The 9~13 roads are used for air-conditioning control of the fan-disc control, and the 485-port is reserved for the use of the protocol card. SDR-mRCU13-FC is a control device with relay output and dry contact input, 120240VAC power input, 13 independent input/output isolation channels, allowing manual switching of the circuit without other bus equipment and software, including 2 The standard resistive load current of the channel is 30A, and the controlled socket and air conditioning power supply are supported. The 11-channel standard resistive load current is 10A. It is used for lighting circuit, lighting power control, curtain control, air conditioning control, etc. ; 9~13 channels are used for fan Disk control air-conditioning control, 485 port is reserved for the agreement to use the card to take power. The independent loop control, pre-editing scene control and scene timing control can be performed through Marswindow. The device data can be uploaded to the HRMS management system for device status management and data statistical analysis. The entire data transmission and equipment control comply with the latest industry standards.